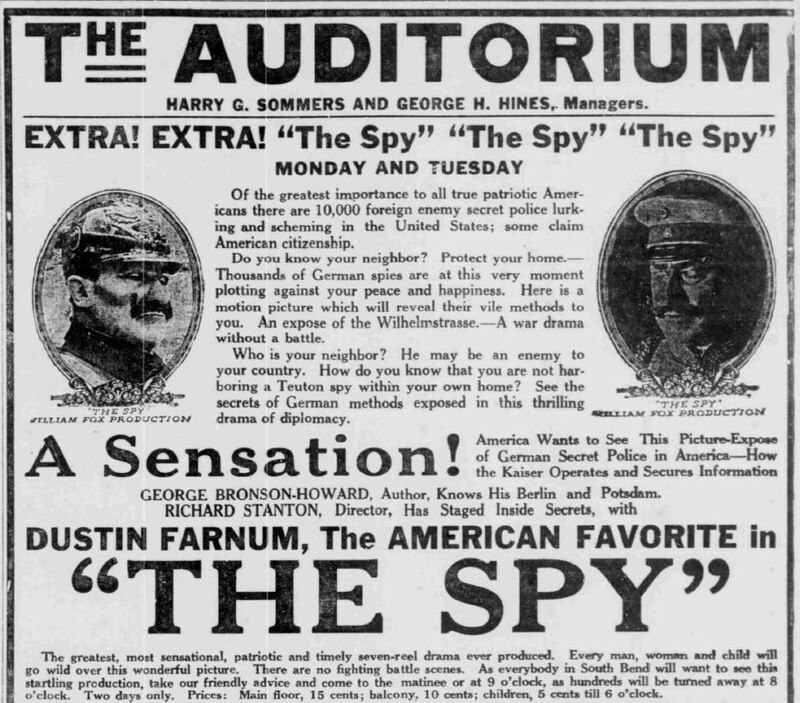 A century ago, American journalism was buzzing with news of the First World War, which the United States had still not entered. 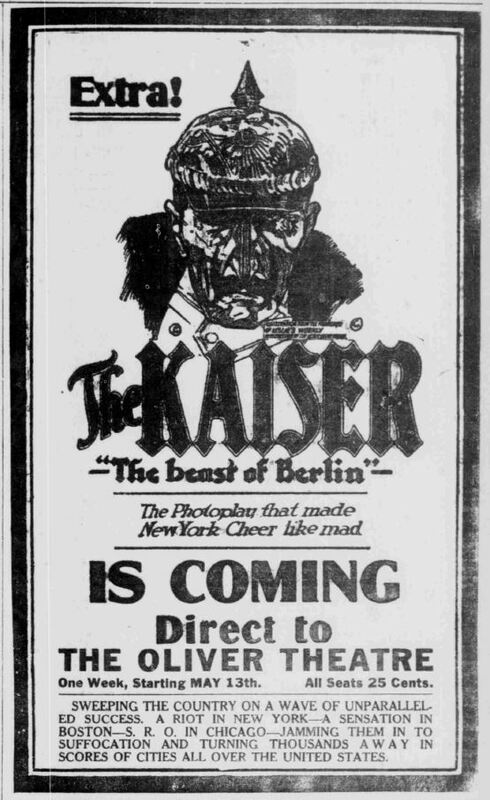 Though jingoistic newspapermen and politicians of different stripes eventually swayed public opinion toward support for the “war against Kaiser Bill,” in 1915 sending American soldiers to Europe was still controversial. Indiana’s own native son, Socialist presidential candidate and labor leader Eugene V. Debs, also spoke out against what he saw as America’s own involvement in militarism. In 1918, on charges of sedition, President Wilson imprisoned Debs for his vocal opposition to the military draft during a speech in Canton, Ohio. 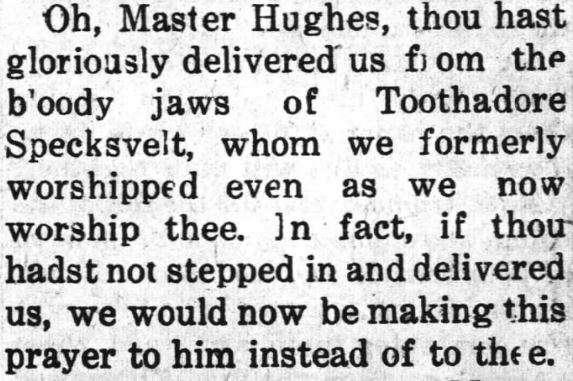 Lampooning the war-hawks “Toothadore Specksvelt” and Woodrow “Woodpile” in the June 1916 issue of his eccentric Fool Killer, James Larkin Pearson perfected the art of satire in this early forerunner of The Onion. 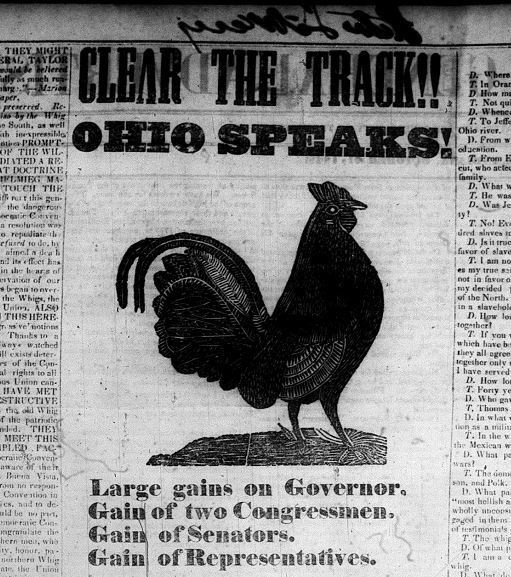 Hoosier history is full of strange ironies. 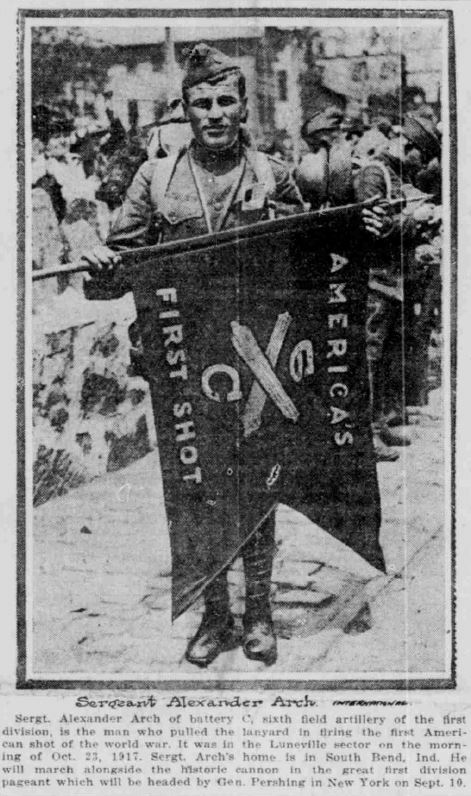 One of them is this: early on the morning of October 23, 1917, in the Luneville sector of eastern France, the reportedly first American soldier to fire an artillery shot against the “Huns” was a 24-year-old sergeant from South Bend, Alexander Arch, a Hungarian. 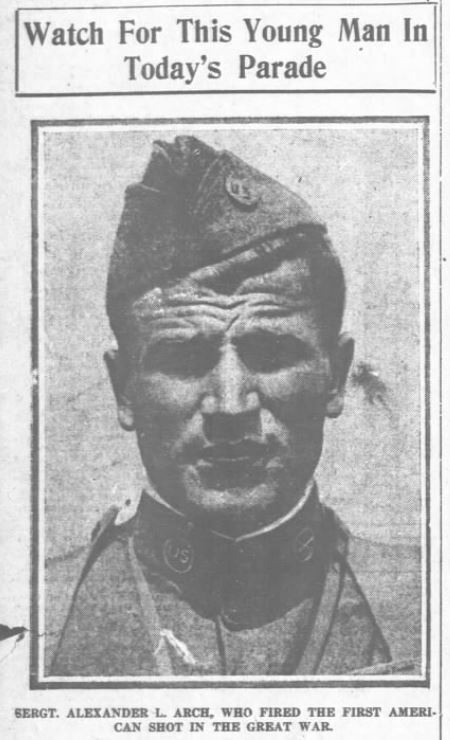 Honored in newspapers in 1917 and again in 1919, after he returned from Europe and appeared in a parade with General Pershing, Arch was an emigrant from Sopron, on Hungary’s western border with Austria. When he was born in 1894, his birth village was part of the Austro-Hungarian Empire, which as an American soldier he was now at war with. Arch’s parents emigrated to the U.S. in 1899, their children following in 1903, when Alexander was eight. (They may have Anglicized their names. His father appears on the 1910 U.S. census as “Steve Arch,” probably István in Hungarian. Arch might have been spelled “Arcs” or “Arcz”.) Steve Arch worked as a clerk at George Toth’s bookstore in South Bend. Alexander’s mother, Theresa, died in 1910. 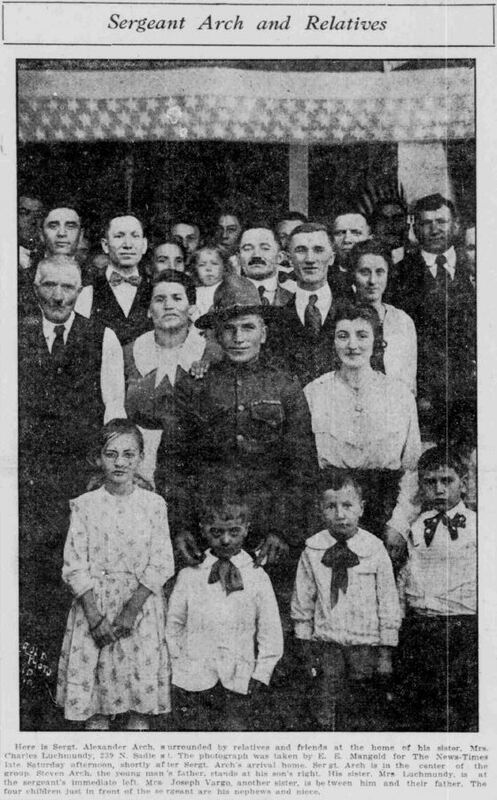 Arch with his Hungarian relatives at 239 N. Sadie Street. 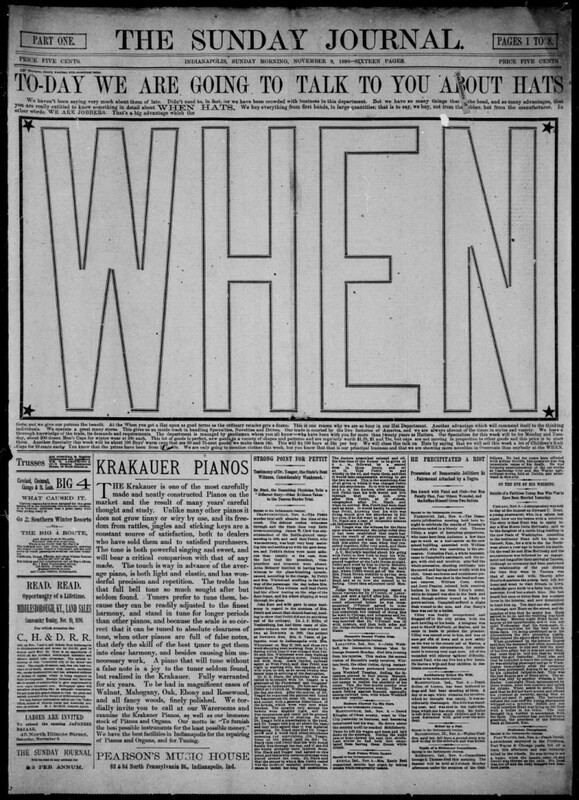 South Bend News-Times, September 29, 1919. 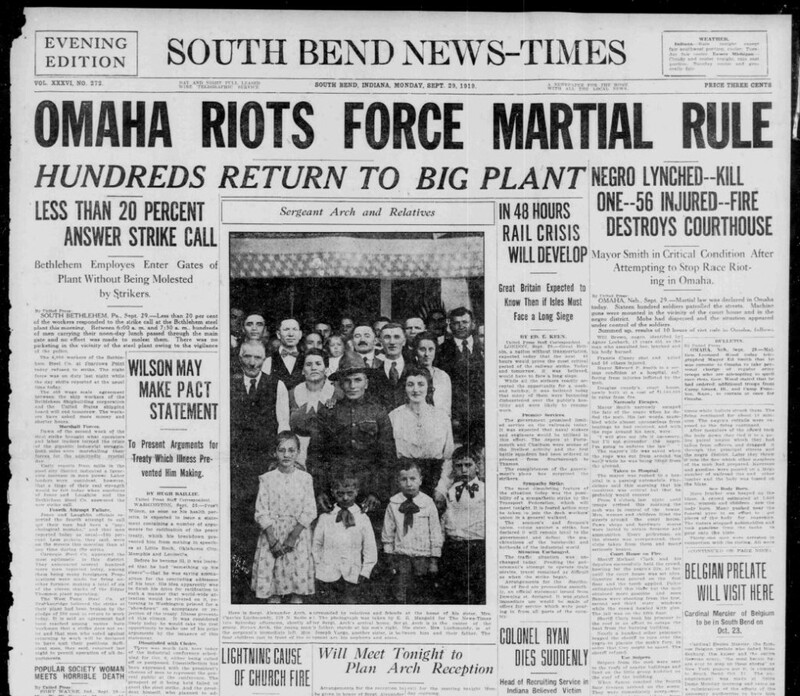 The photo appeared on the front page of the paper during the infamous Omaha Race Riot in Nebraska. In 1910, when he was 16 years old, Alexander Arch was employed at the Oliver Chilled Plough Works, one of South Bend’s major industries. After Our Lady of Hungary Catholic Church was founded in 1916, the family were parishioners there. Before heading to Europe, Arch was briefly stationed on the Mexican border during General John Pershing’s expedition against Pancho Villa. The first American artillery shot of the war was fired at five minutes after 6 o’clock the morning of Oct. 23, 1917, from a position about 400 meters east of Bathlemont, in the Luneville sector. A French 75, dragged by the hands of American artillerymen over 800 meters of rough roads on a pitch black night, roared America’s artillery prelude at daybreak. A heavy fog flashed into flame, a shrapnel shell coursed over the woods and valleys of Meurthe-et-Moselle, crossed a boundary line and fell somewhere in Lorraine. Battery C of the sixth field artillery is so positive that this shell was America’s first shot that it has just prepared a sworn statement signed by an officer and four enlisted men who were in on the event, telling all the circumstances leading up to it. 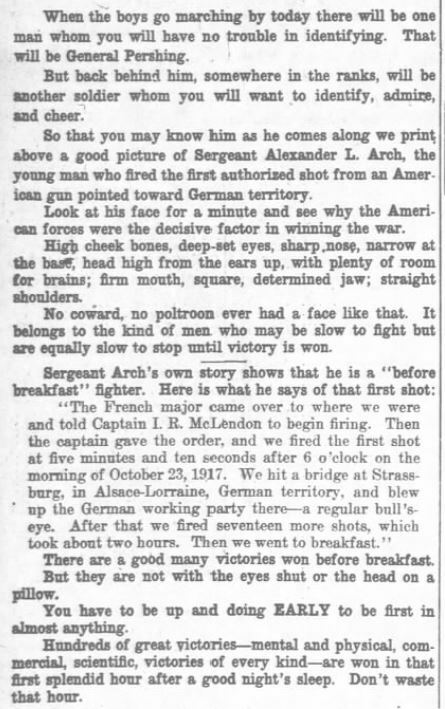 The statement reveals, incidentally, that the original shell casing is now in Chicago, and that 18 other casings of that first morning’s firing were distributed among Pres’t Wilson, Gen. Pershing, Gen. Sibert, then commanding the first division, and others. The gun is now at the United States Military Academy at West Point with other newly transported war trophies. Before it left France, though, it had fired 20,000 rounds in action, and none of the gun crew serving it had been wounded. The firing of the first shot was ceremonial, according to the signed statement, each man in the gun crew performing some task. One soldier set the sights, another the elevation of the range, another the angle of site and another cut the fuse. Twenty men were gathered about the gun when the command “Fire!” was given. Because of the fog it was impossible to observe the effect of the first shot, but at 7 a.m., when the fog lifted, the firing was directed from an observation post to Haut Rioville farm in No-Man’s Land. Sgt. 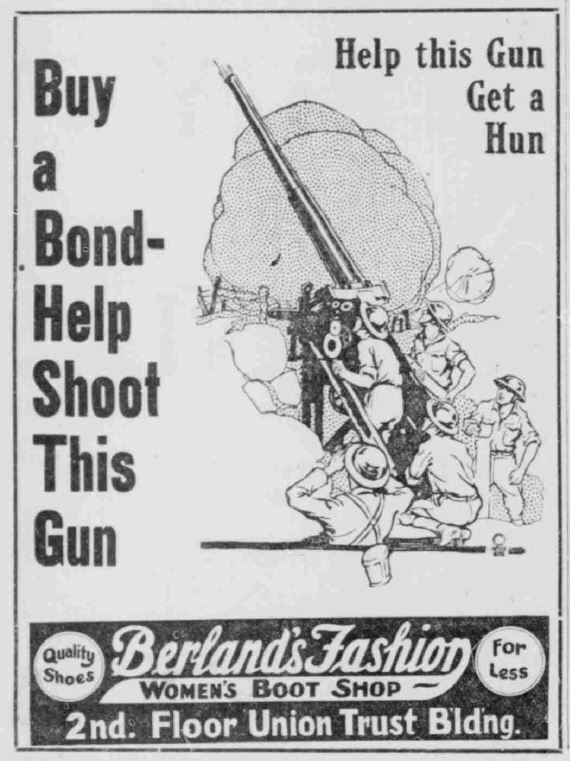 Arch was chief of the gun crew, and at least one other man, Corporal Lewis Varady, a fellow Hungarian, also came from South Bend. 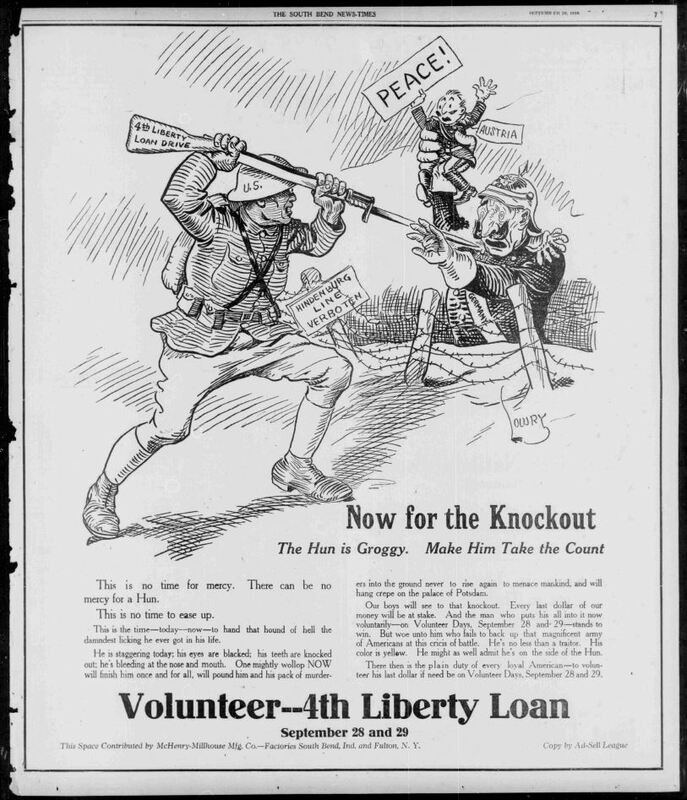 America’s direct involvement in World War I lasted barely a year and Arch was back in the U.S. in mid-1919. In September, “Thunderous cheers followed by loud applause greeted Sgt. 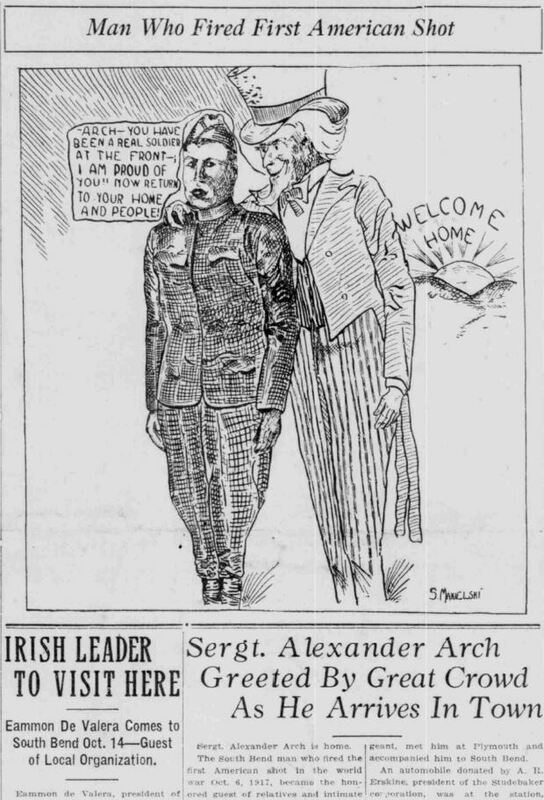 Alexander Arch, South Bend’s history maker, upon his visit to the House of Representatives. . .” Arch and Varady received a three-minute standing ovation before heading on to Camp Zachary Taylor near Louisville, Kentucky, but not before receiving a triumphal welcome home in Indiana. After the acclaimed veteran was mustered out of the army at Camp Taylor, he worked as a machinist and auto worker, probably at the Studebaker plant. Arch married Julia Rebics in 1924 and the couple had four children. He died in 1979. 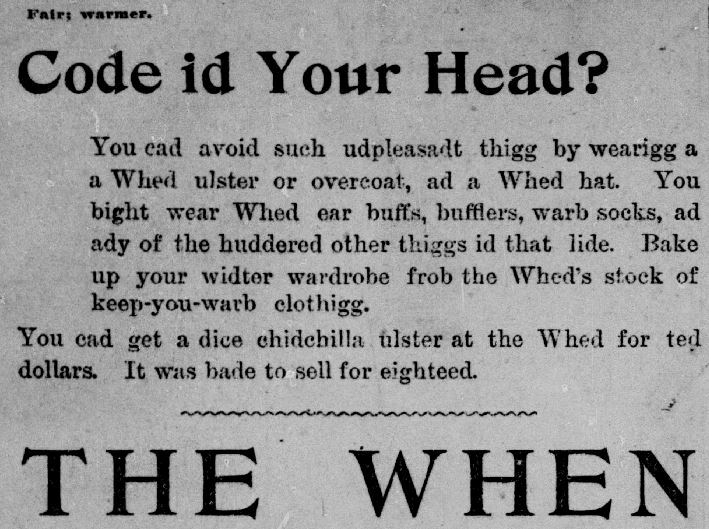 South Bend News-Times, September 28, 1919. The News-Times had some of the best illustrators in Hoosier journalism. 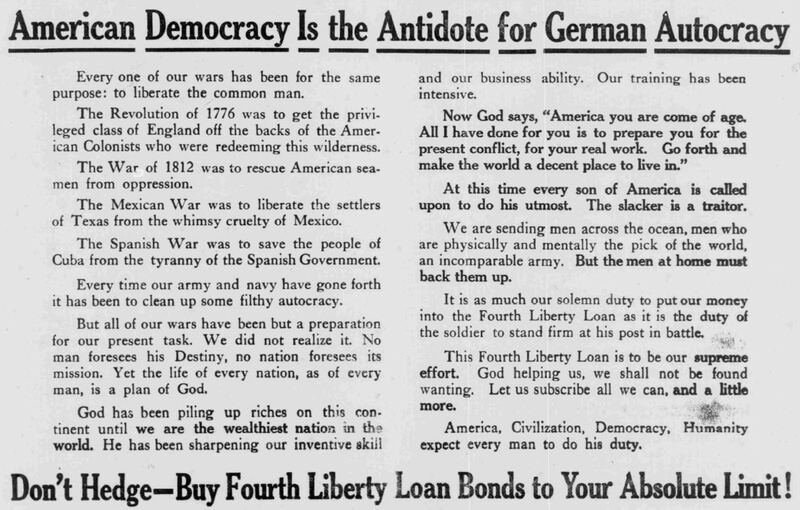 Here are some other historic ads, cartoons, and flashy martial cries — most of it blatantly Germanophobic — published in the South Bend paper around the fateful year 1918. 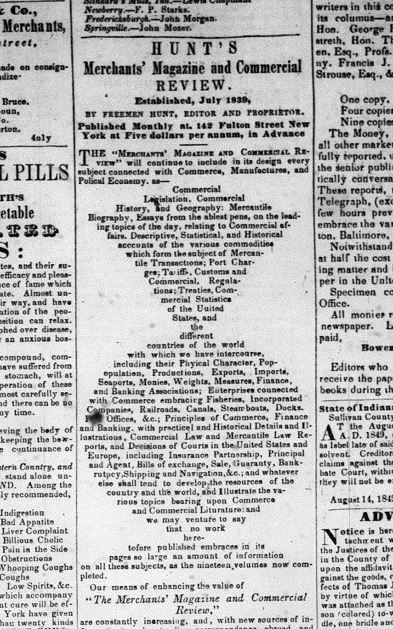 Hoosier State Chronicles is getting ready to upload a large run of issues of the Indianapolis Journal from the mid-1890s. 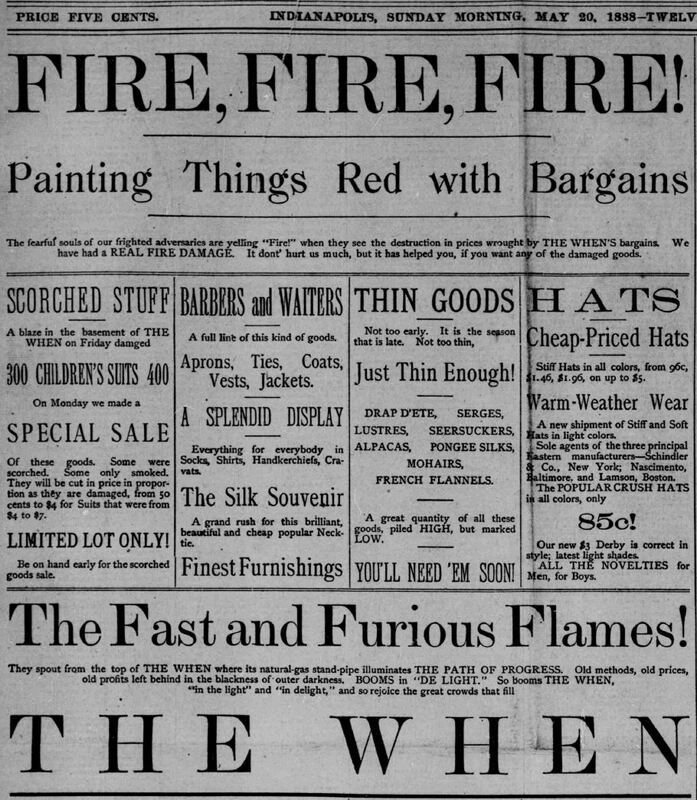 Dominating the front page of Sunday editions in those days are massive, elephantine ads for one of the most colorful clothing stores ever to exist anywhere in the U.S. 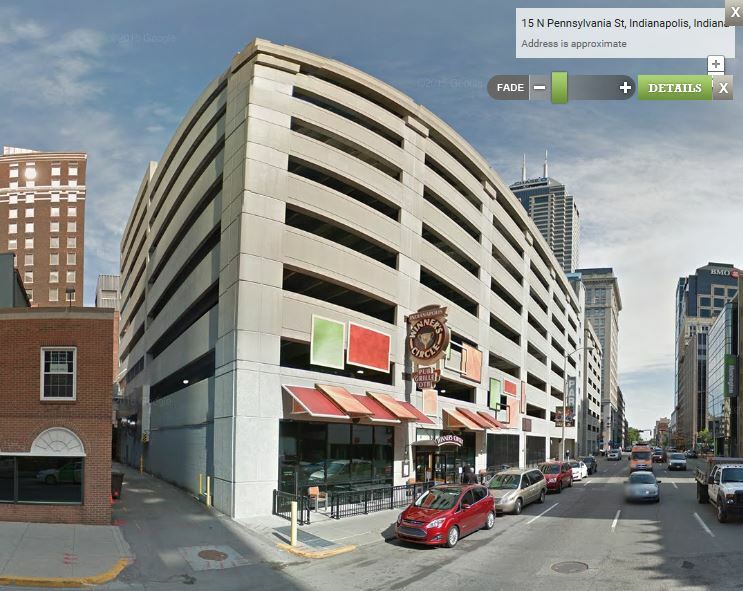 This was downtown Indy’s great shopping emporium, The When. In the days before parking garages and flight to the suburbs plunged downtowns into decline, urban cores all over America were a fascinating architectural wonderland. Panoramic images of Indianapolis 120 years ago often leave me wondering if I live in the same town, so devastating has been the toll of the wrecking ball, the termite, and (yes) bad urban planning. 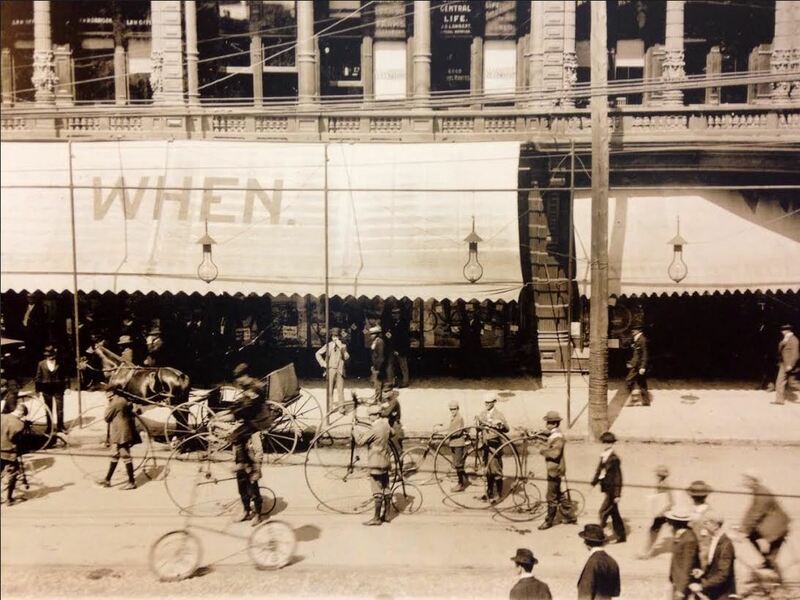 Before the auto, pedestrians walked or were funneled down to the business district on trolleys or carriages from neighborhoods not very far out. And amid the amazing visual spectacle that met shoppers’ eyes at the turn of the century, there stands the ingenuity, humor, and incredible marketing smarts of John Tomlinson Brush. Born in upstate New York in 1845 and orphaned at age four, Brush was raised by his grandfather, went to business college, then served in the 1st New York Artillery during the Civil War. 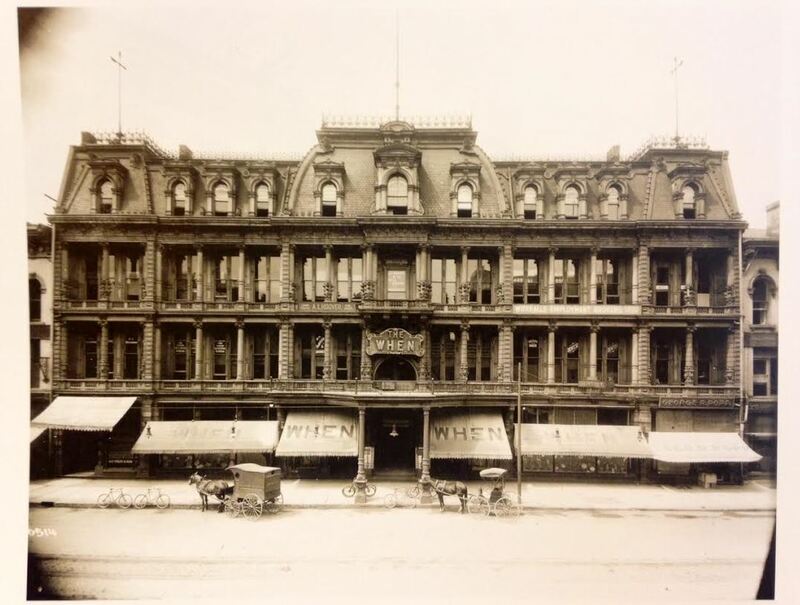 Moving from Troy to Indianapolis in 1875 at age thirty, he purchased a brand new, Napoleon the Third-style building at 36 N. Pennsylvania St. and planned to open a branch store of a New York City clothing wholesaler there. Brush kept changing the opening date. 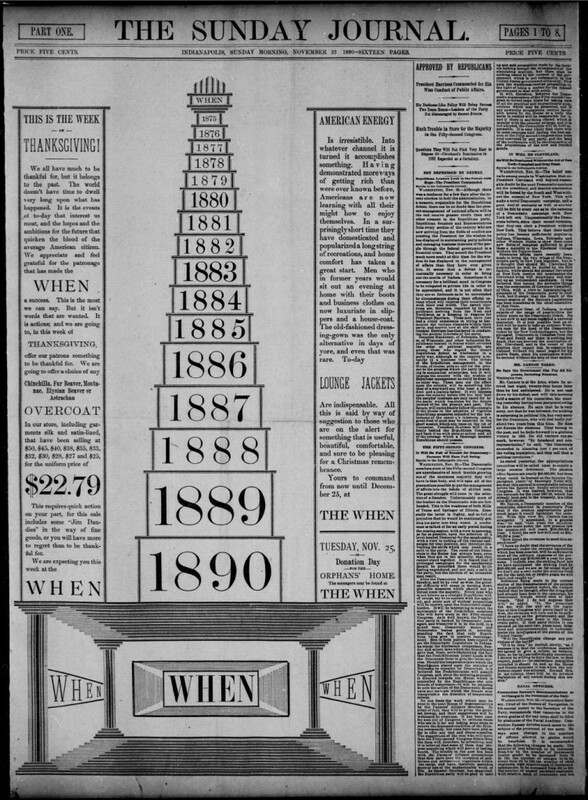 Probably as a tease to drum up interest, in February 1875 he hung a huge sign outside the store with the simple word (more an exclamation than a question) “WHEN?” Advertisements in the local newspapers also carried just that one-word tease. The name stuck, and the lavishly decorated clothing outlet became an instant consumer hit, soon ranked as the biggest of its kind in Indiana. 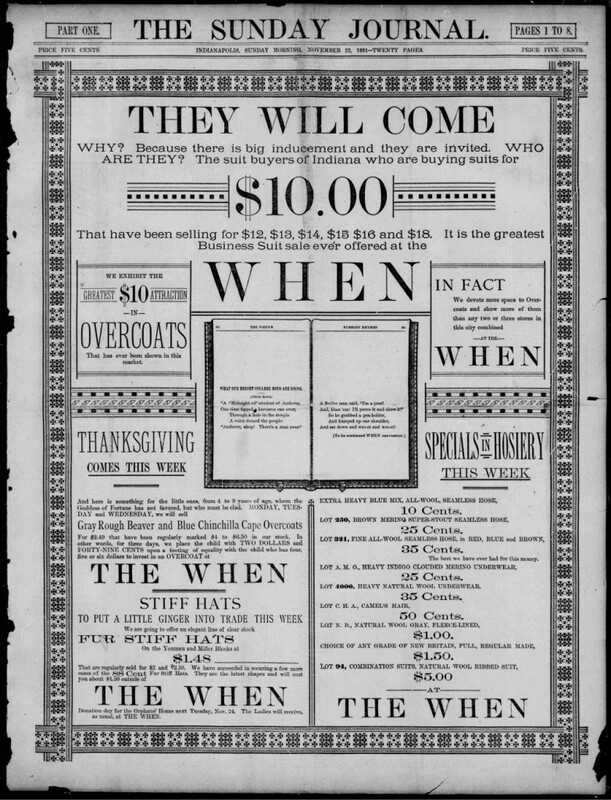 Ads for The When dominated the front page of the Indianapolis Sunday Journal for over two decades. New York native John Tomlinson Brush, 1845-1912, was a savvy salesman, razor-sharp humorist, and baseball magnate. 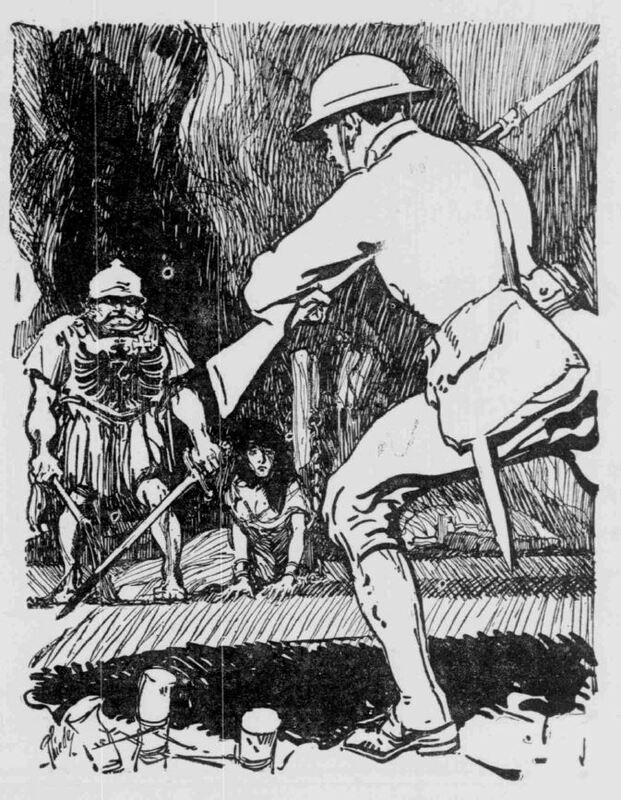 John T. Brush (some thought his name was John “Tooth” Brush) was gifted with an ample sense of humor and, I hear, was also a clever cartoonist, though I haven’t seen any of his illustrations. His knack for marketing was far-reaching. Not only did he see The When “elegantly appointed” with iron balustrades, gas lighting, and a courtyard, he also outfitted it with an array of unusual attractions meant to lure shoppers. 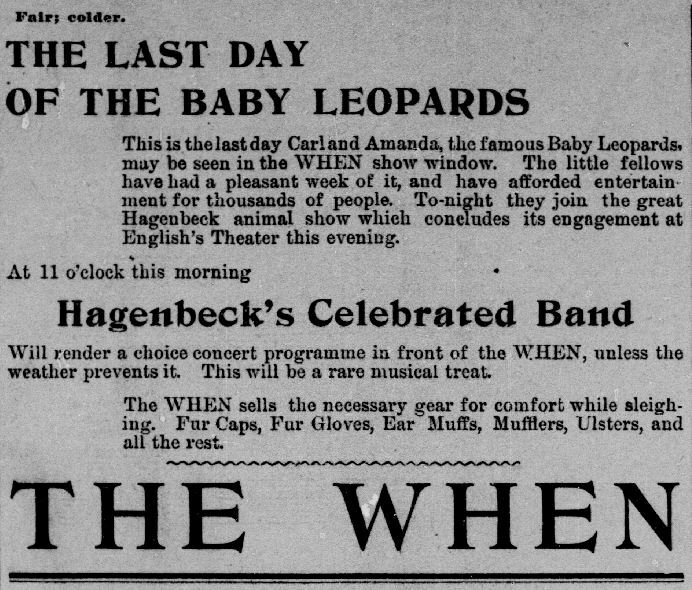 The When had a baseball team, called The When Store team, and a resident brass band, The When Band. Brush’s musicians played in a second-floor band shell and gave Saturday evening concerts outside on the street and even up on the roof. As we’ll see below, other colorful attractions also greeted shoppers. Brush got rich quick in Indianapolis, but unlike many capitalists with Eastern roots, he stuck around for good. And in the 1880s, The When’s owner became a prominent pioneer of baseball both in the Hoosier State and around the country. Originally conceived to drum up business for the store, the Indianapolis Hoosiers were a short-lived local baseball team bankrolled by the clothing merchant. In 1882, he financed the creation of a ball park, Seventh Street Park, also called Tinker Park, at a site now occupied by Methodist Hospital. The Hoosiers played in the National League from about 1885 to 1889, when they folded. 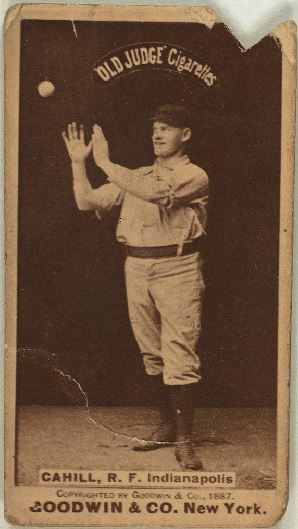 Brush later bought the St. Louis Maroons, the Cincinnati Reds, and eventually the great New York Giants, which he owned from 1902 until his death in 1912. Local legend has it that Brush first became enthusiastic about the game after reading a Spalding Guide confiscated from an idle store clerk. Or that Brush’s interest stemmed from acceptance of stock in an Indianapolis ball club as payment for a debt. The facts are more prosaic. 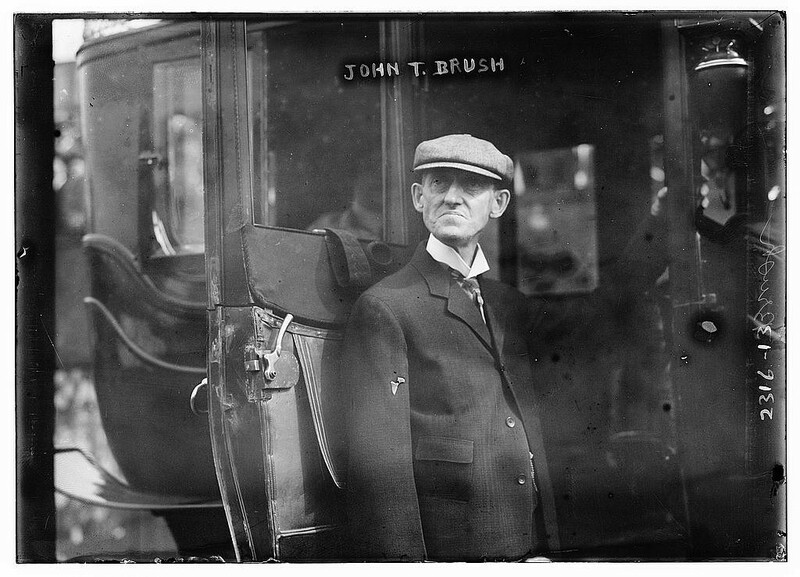 Brush was first exposed to baseball while working at company stores in upstate New York, a hotbed of the early game. Later he seized upon baseball as a vehicle for advertising The When Store. In 1882 Brush organized a municipal baseball league, building a diamond with a grandstand in northwestern Indianapolis for league games and engaging Jack Kerins as player-manager of the When Store team. 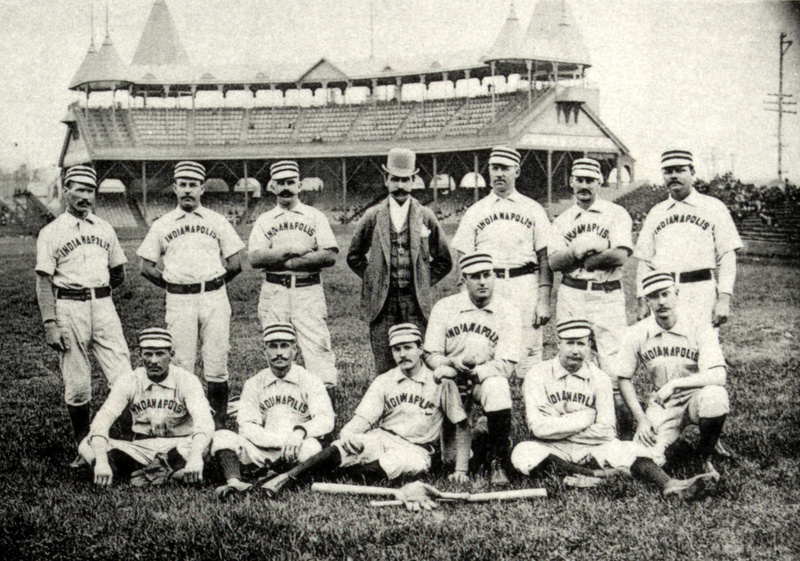 The Indianapolis Hoosiers at Tinker Park, 1888. I assume Jack Kerins is the man in the center. 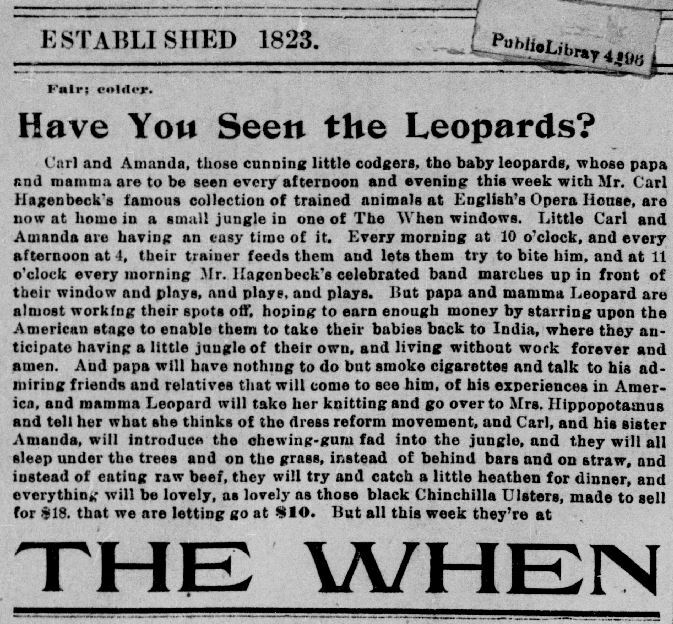 As a kind of New Year’s gift to his loyal shoppers in 1895, Brush helped bring a clever attraction to downtown Indy: a pair of leopard cubs. 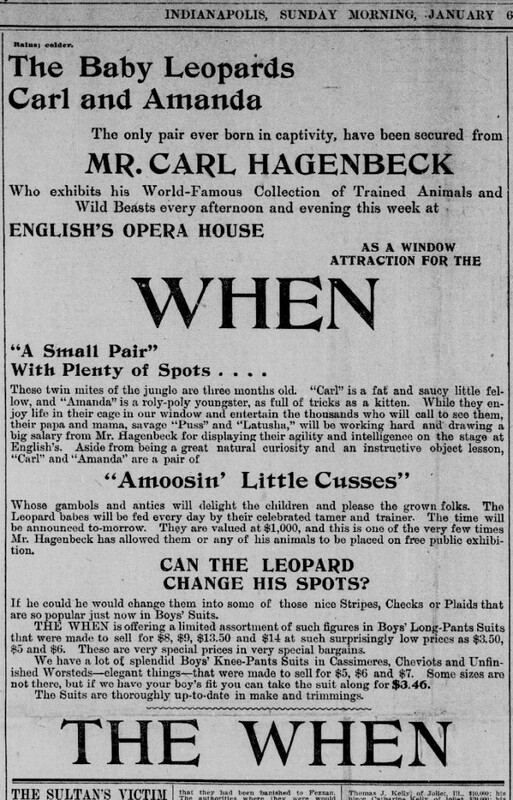 The adorable creatures, named Carl and Amanda, were loaned from the great Hagenbeck-Wallace Circus, which wintered in its home base of Peru, Indiana. 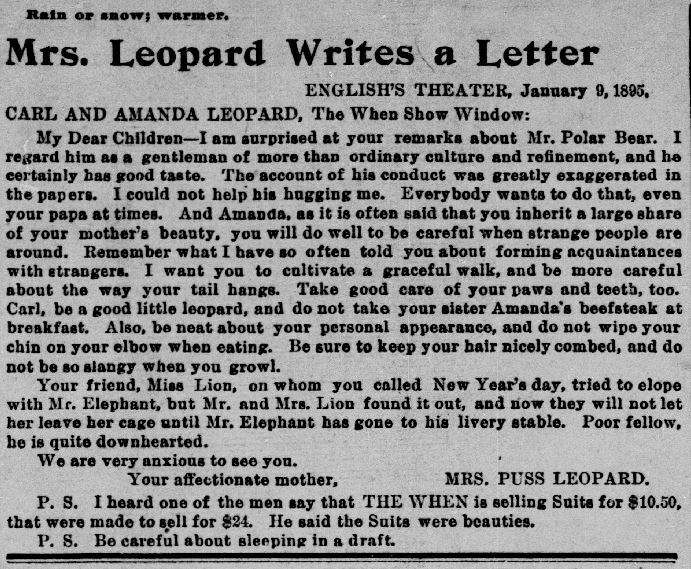 The cubs spent about a week as a window attraction at Brush’s store while the circus performed at English’s Opera House nearby. 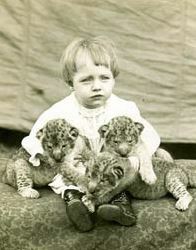 Chad Ballard, son of Hagenbeck-Wallace Circus owner Ed Ballard, around 1915, possibly in French Lick, Indiana. French Lick West Baden Museum. 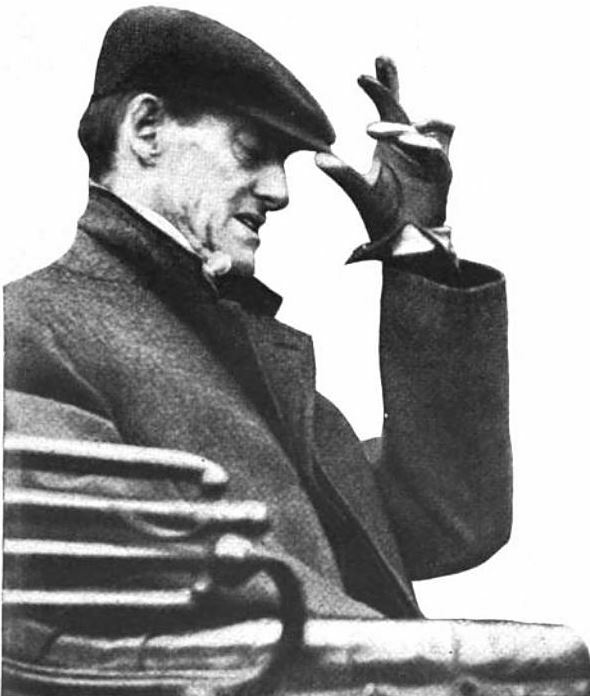 John Brush lived to see the New York Giants play in three World Series and was married to stage actress Elsie Lombard. Suffering from a nerve ailment after 1902, he died in his private railroad car near Louisiana, Missouri, in 1912. He came home to a lavish funeral in Indianapolis, attended by many of the greats of the baseball world. The When Building, which also housed Indianapolis Business College, was sold off to C.S. Ober in the 1940s and came to be known as the Ober Building. 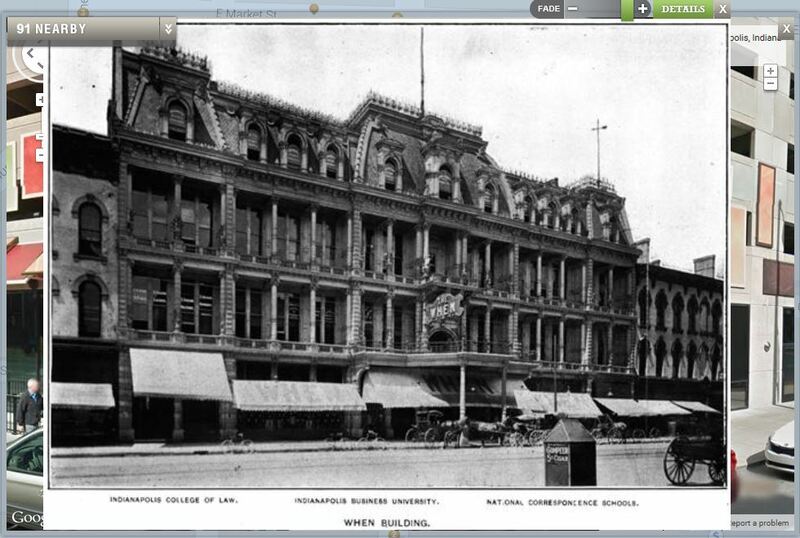 Like much of the city’s former architectural splendor, it was demolished by a wrecking ball and is now the site of a parking garage. Though the When is “Gone With the When,” it’s worthy of our deepest praise. Here are some of my favorite advertisements from Way Back When. 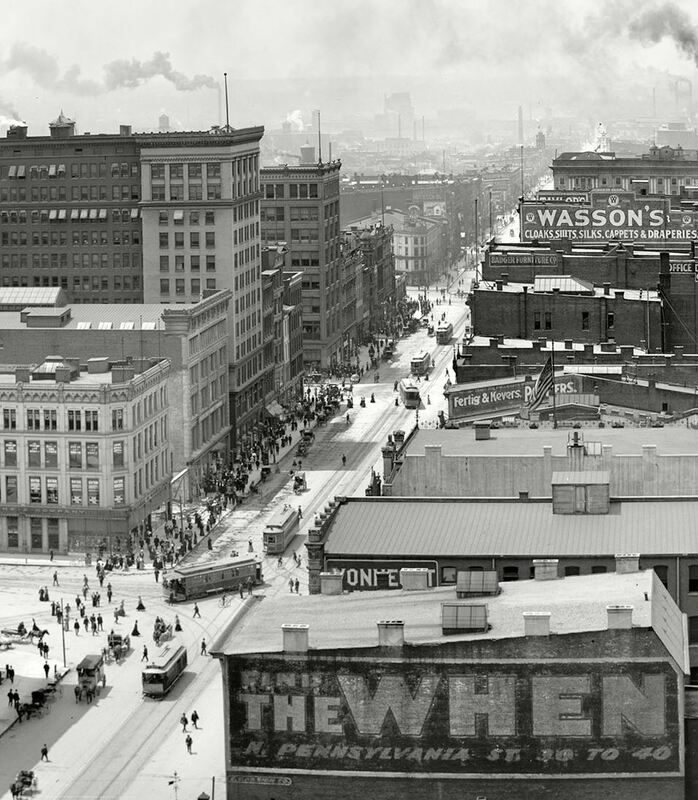 The When Clothing Store stands in the right foreground in this panoramic image of Indianapolis from 1907. Well, gentle readers, if u r like me, u r probably annoyed @ the terrible vocab skills of the txt generation. But W8 just a second. Txtspk isn’t new. It got 2 to the Hoosier St8 B4 U.
John Jones probably saw “Katie Jay of Uticay” in a copy of Dwight’s American Magazine, published in New York in February 1847. An even earlier “cousin” of this amazing poem was printed in the Utica Organ in upstate New York, the Columbia (Penn.) Spy, and Atkinson’s Casket, a popular Philadelphia literary journal, as far back as 1832. 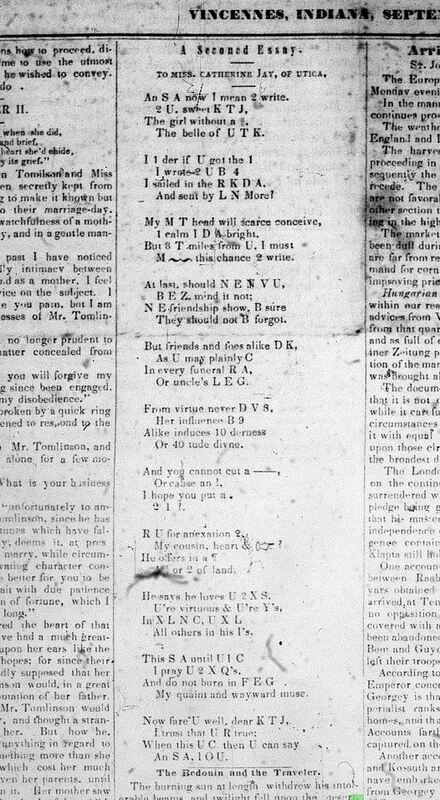 The original “KTJ,” in turn, might have been inspired by two incredible British “text-speak” dirges published in The New Monthly Magazine in London in 1828. Katie Jay’s trans-Atlantic cousins were no less than the unfortunate “Miss LNG of Q” (Ellen Gee of Kew, blinded by a “B” sting in the “I”) and “MLE K of UL” (Emily Kay of Ewell, burned to death while putting “:” [coal on] a kitchen fire grate.) Sad nymphs and “SX” (Essex) maids, these. Hark, friends, gather round and listen 2 their f8, and please 4C: 1 day U 2 shall cease 2B an N.TT! 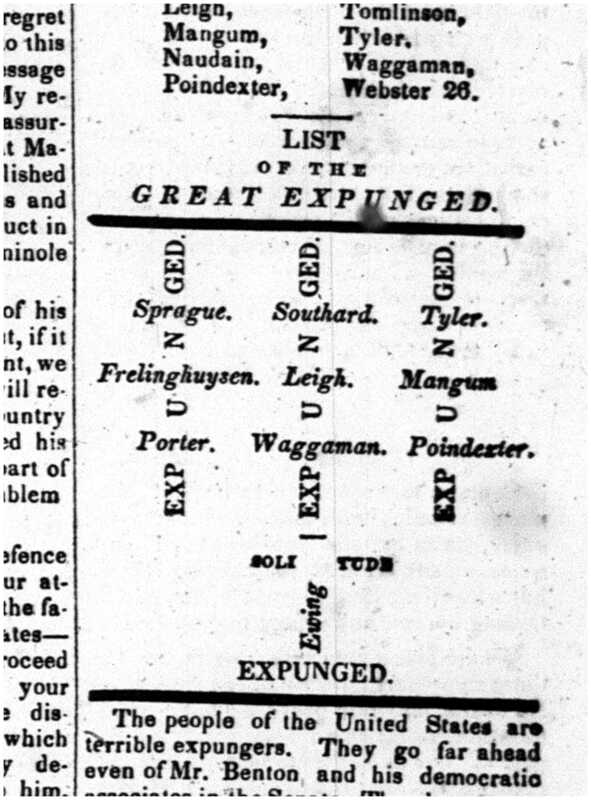 On September 22, 1849, “KTJ” appeared on the front page of the Vincennes Western Sun. Like this poem, most of what was printed in the Vincennes paper over the years wasn’t local news or literature, and rarely featured much writing by Hoosier wags. 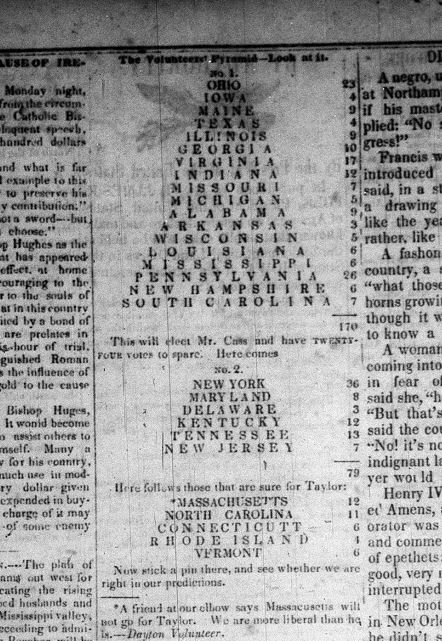 In fact, most of the paper in the late 1840s was taken up with news from Europe, the East Coast, Texas and Mexico. KTJ shows up next to the latest news from the packet “Europa,” just docked at Halifax, Nova Scotia: Louis Kossuth’s Hungarian Revolution is still being fought. Kossuth’s revolution against the Austrians eventually failed. A few years later, in the winter of 1852 (“cold as cold can B?”), the defeated Hungarian patriot sailed over “the Atlantic C” and toured Indiana, coming on the steamboat Wisconsin from Cincinnati. Kossuth was hailed as a hero of democracy in the Indiana State Sentinel and the Terre-Haute Journal, among other papers. A small town in Washington County in southern Indiana was named after him. Alas, “Kossuth, Indiana” has now almost vanished. We mourn its DK. 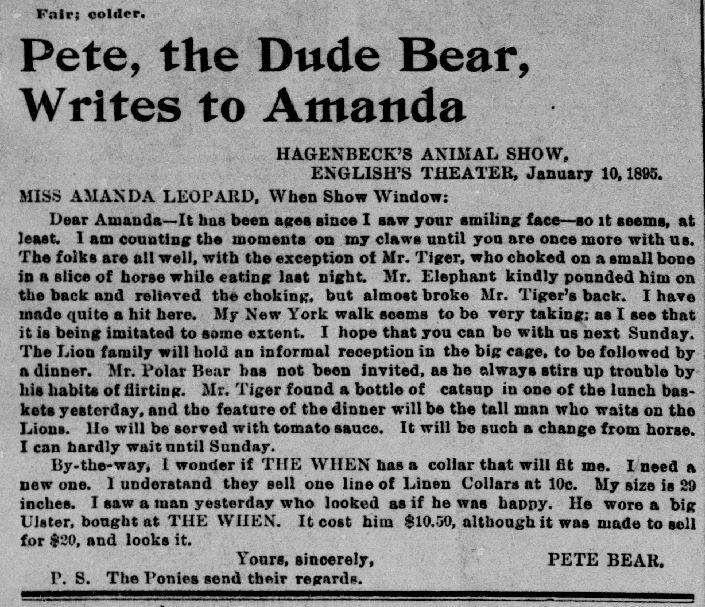 With news sometimes traveling west at a great time-lag, people were always eager for entertainment in the meantime. Sometimes printers like Elihu Stout and John Jones had no news to print, so they regaled readers with whatever they could find. And unlike the news, poetry — even when written in “text speak” — can occasionally be timeless.